If you moved your website to another server and the paths to the production and staging site have been changed, WP Staging will lose its connection to the staging site and you are not able to push the staging site to the production website any longer. Instead of that, you’ll get a fatal error telling you that WP Staging cannot find the staging site or the folder wp-content. If you are familiar with phpmyadmin and if you are not scared by doing a slight modification in the production database you can resolve this easily by changing the path to the staging site. 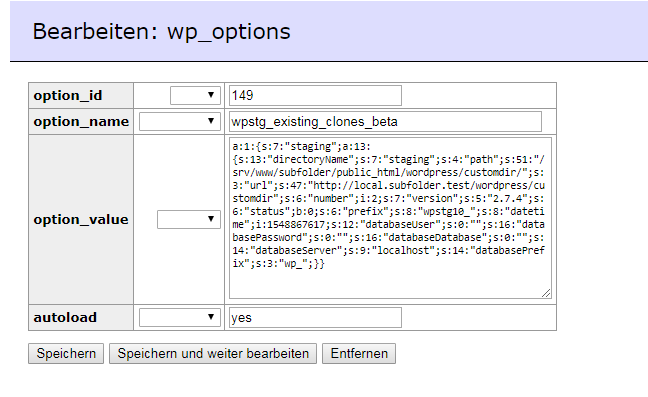 Open phpmyadmin and look for the option_name wpstg_existing_clones_beta in the database table wp_options. Get the value of that column and copy it into an empty text file for backup purposes. Now, change the path to the staging site in the input form 2 to the new location of your staging site! 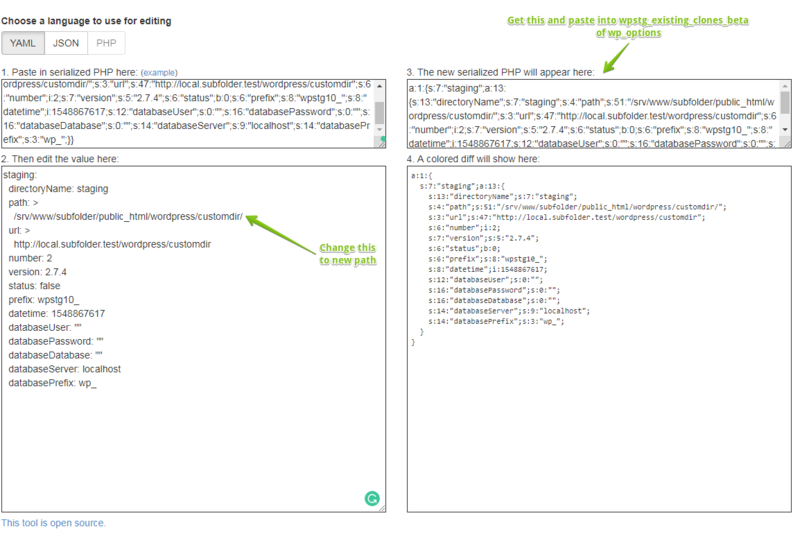 WP Staging > tools > system info and finding the value ABSPATH. This is the path to the root of your WordPress website. Just add the subfolder name of the staging site and you’ll get the full path to your staging site. Go back to phpmyadmin and paste the modified serialized PHP data back into the field wpstg_existing_clones_beta, overwrite the old value and save it. Now WP Staging is connected again to your staging Site and you can migrate your staging site to live.